This talk was held at the 13th Blender Conference in Amsterdam. 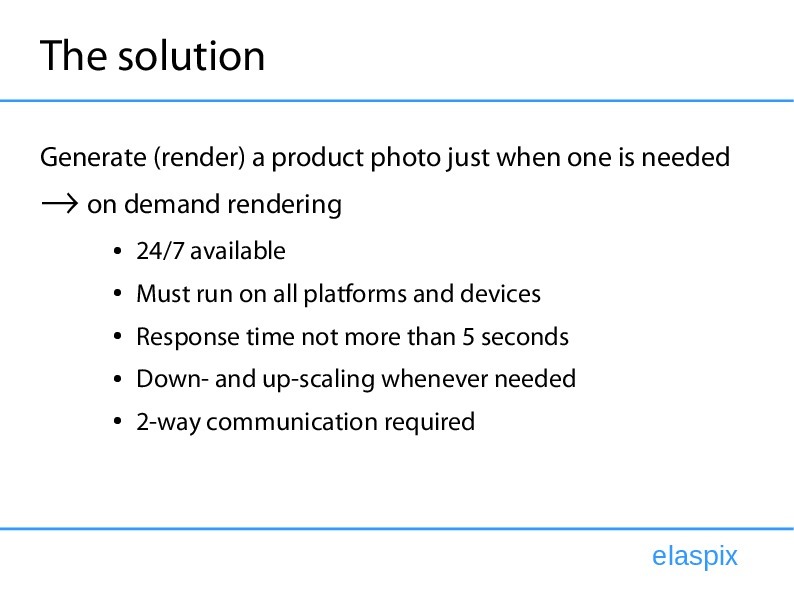 In the first part of this talk I introduce the reader to the E-Commerce Application for which a Blender render farm is used. 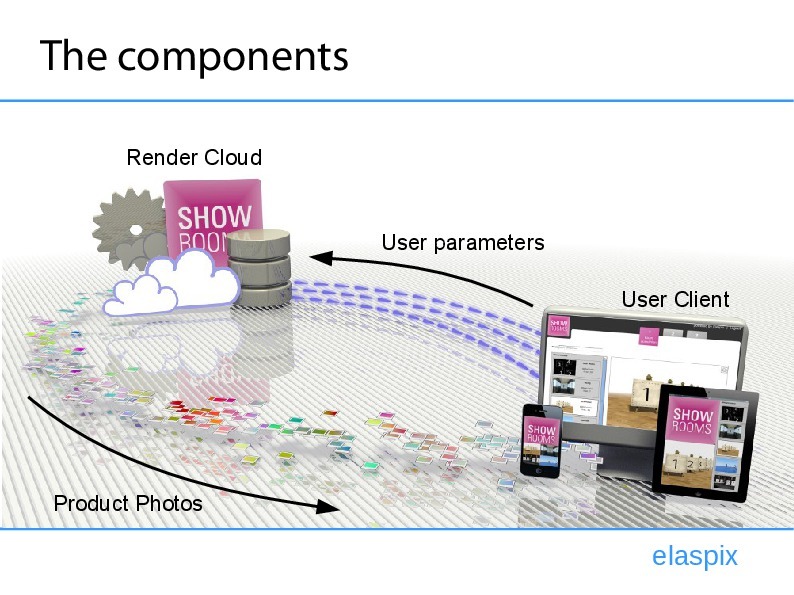 It is shown how the E-Commerce offers many opportunities for render companies like Elaspix. This talk was held at the 13th Blender Conference in Amsterdam. In the first part of this talk I introduce the reader to the E-Commerce Application for which a Blender render farm is used. 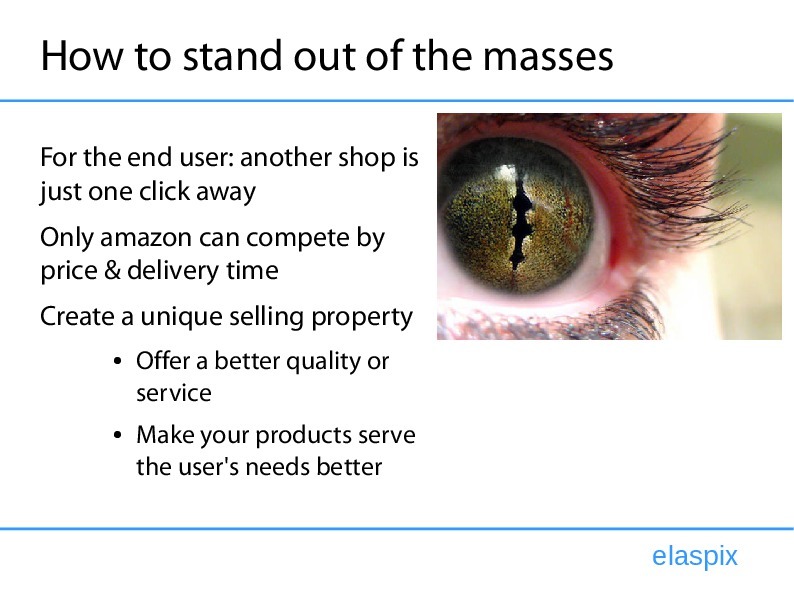 It is shown why the E-Commerce offers many opportunities for render companies like Elaspix. features before closing the deal. 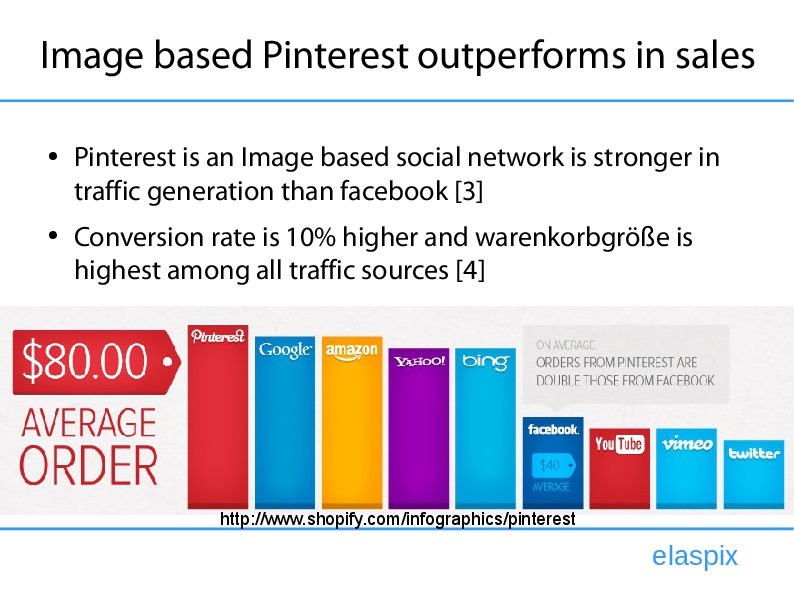 In general, the importance of images becomes even clearer if we look at social networks like Facebook or Twitter. Posts that have an added image produce more clicks, views (+94%) and comments (+104%) in comparison to posts with just plain text. 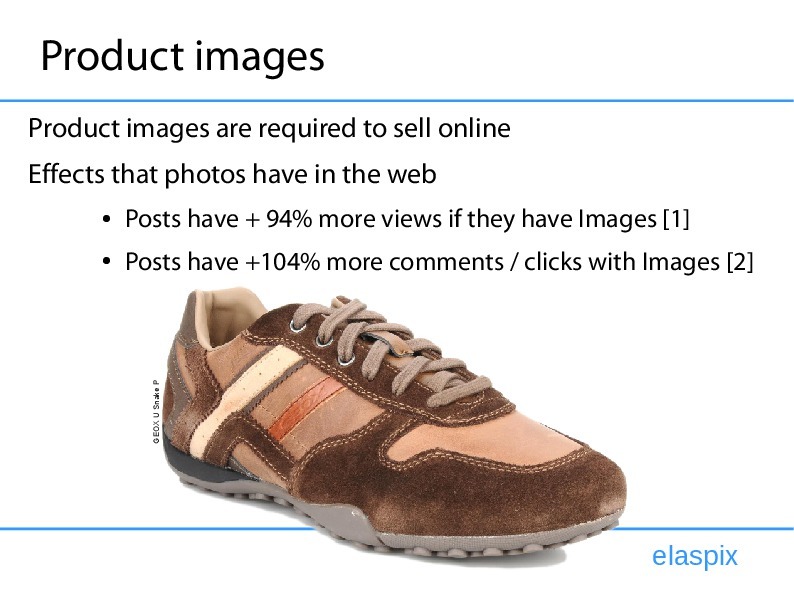 Thus, it is fair to say that images can drive activity and sales in E-Commerce. This becomes even more visible at the social network Pinterest which is built completely upon images. While surfing the web, a user can “pin” images on any website. Those images are then collected in the User’s Albums which are thematically sorted and can be subscribed to by other Users. Because of the subscription, friends are informed about new images and later on watch those images. Finally, if an image has attracted attention, they often visit the original webpage. Thus Pinterest drives traffic to websites, which is, as some studies suggest, even traffic of highest quality when seen from the viewpoint of a shop-owner. Subscribers who have visited the original site after having seen the product image, are likely to buy the product and even have large shopping basket sizes (or expressed in E-Commerce terms the conversion rate is 10% higher for Pinterest traffic). merchants and shop-owners the times become harder as competition increases. Clearly, higher competition within E-commerce businesses requires shop owners to think about their visibility. What merchants usually do is to think about a unique selling proposition (USP) which is required to stand out of the masses. 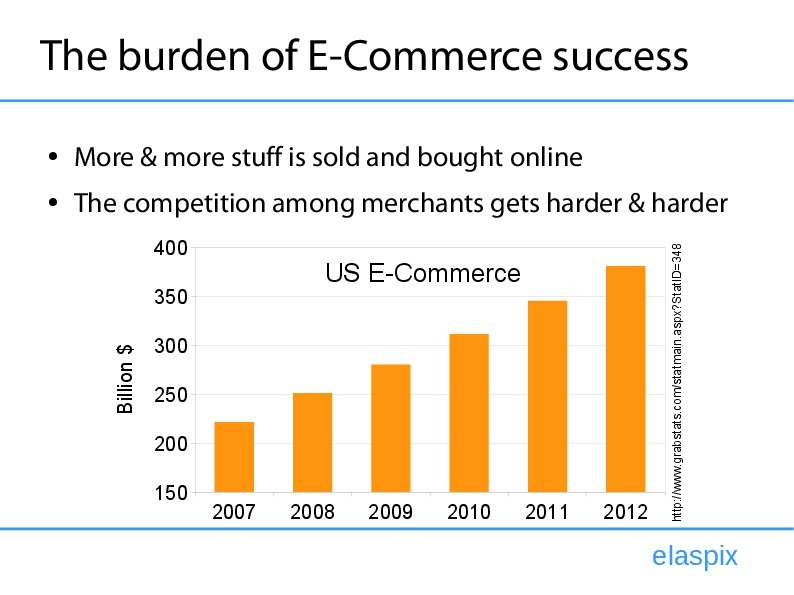 However, the price & delivery time as the most obvious attributes for separation from others is not a good choice as large merchants like amazon will always outperform smaller shops because of the high selling volume advantage. But one can offer a better service around products or can sell products that serve the user’s needs better by making it possible to customize them. To which amount a product is offered to be customizable is a matter of the user demand and production capabilities. For example, customers could assemble the product from parts they can choose from, so that the customer can actively determine from what the product is made of as in the case of self-mixed cereals of the German company MyMuesli which allows users to choose from ingredients as nuts, rosins, corn etc. memory or hard drive space so that the notebook better matches their needs. 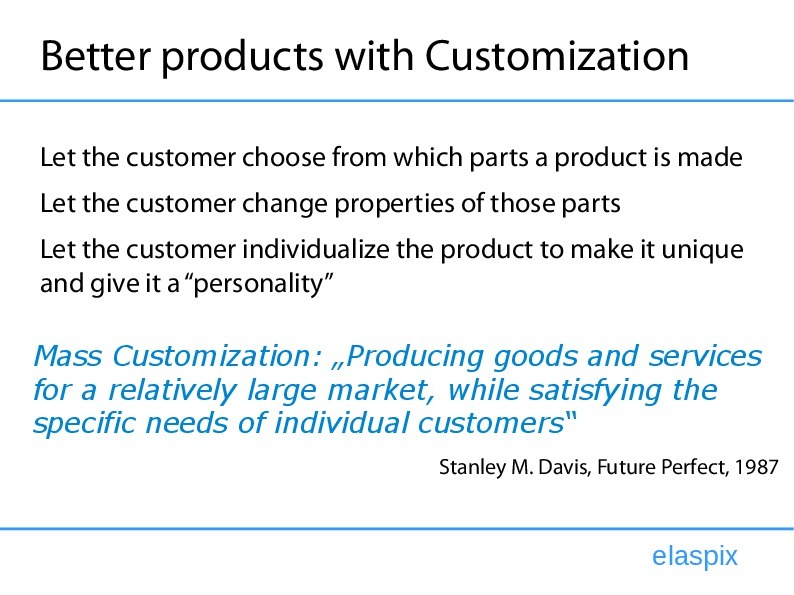 The third flavor of customization is to let people make products to become THEIR products by adding personal information. This can be seen very well at Spreadshirt where customers upload photos and text to create their individual T-Shirt. This is unique rather than being just another T-Shirt copy. The above flavors are all parts of the so called Mass Customization which is to offer products for a large market while satisfying the individual customer needs. 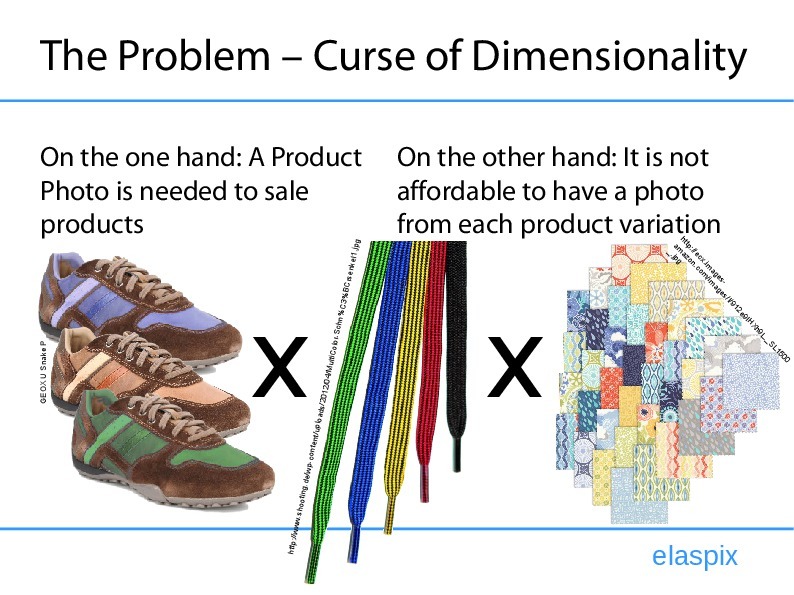 After suggesting to A) use photos to drive sales and B) to let customers change the product properties, shop owners are faced with the problem called “Curse of Dimensionality”. Let’s assume a product has three parameters that can actively be changed and that each parameter has 10 variations. If for example the customization process allows having shoes with theoretically 10 colors, 10 types of strings and 10 different types of materials, the shop owner needs to prepare 1000 photos in order to show the customer a photo of the assembled product. This, usually, is not feasible, but there is a solution to this problem. By using On-Demand-Rendering of product photos, a product photo is created just in the moment the customer assembles the product. 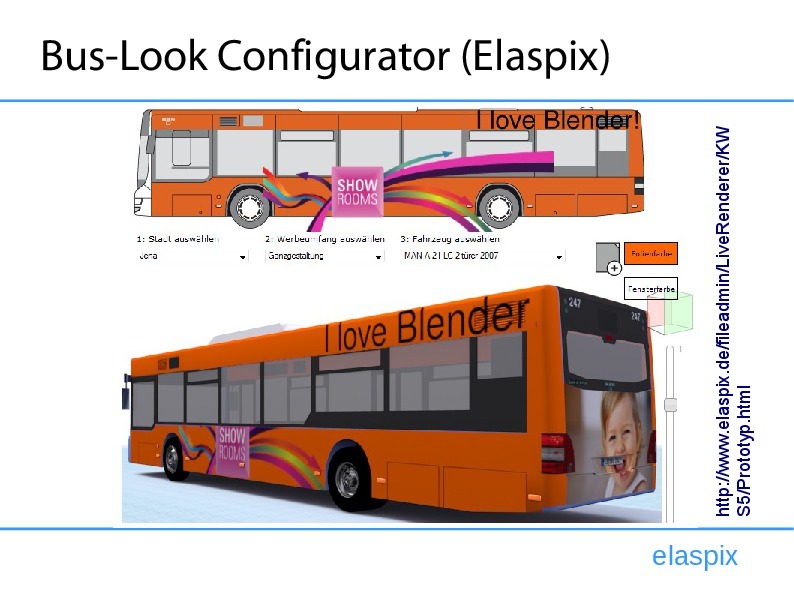 Elaspix offers such a system built around the Render Engine Blender. However, such a system must meet some requirements which are all-time availability (shops usually sell around the clock), compatibility (customers are shopping using all kinds of devices like desktop computers, tablets, smartphones etc. ), fast response times (the faster the better), scalability (the system should work for 1 as well as for 1000 simultaneous users), and finally a 2-way communication. The 2-way communication is required as users assemble a product using their web browser or mobile application. Those selected parameters are transferred to the Blender render Cloud which then sends back the just-in-time prepared product image. Here are some examples: A configurator to inspect how clothes fit the own body was prototyped together with b-za.com. Customers can change and equip clothes by adding patterns (Rhinstones, Buttons, Rivets and Beads) and also set their personal convectional and waist circumference. 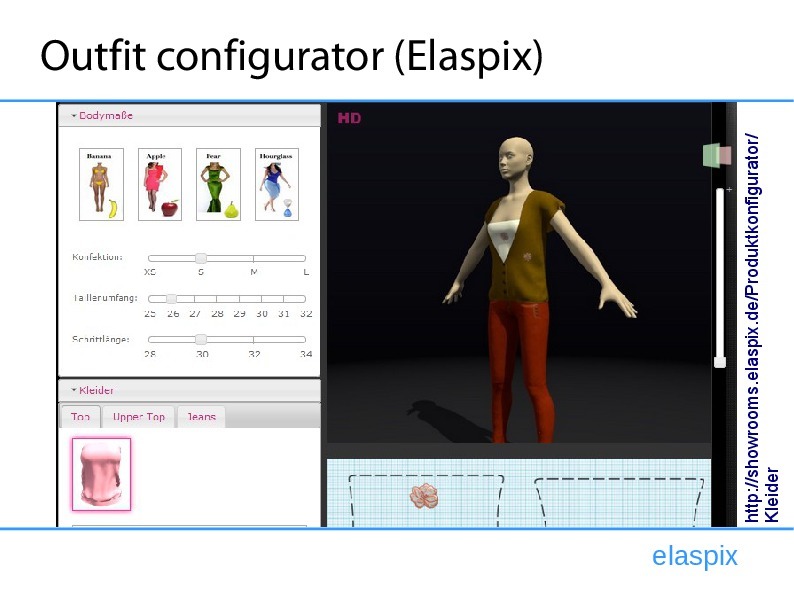 By using cloth simulation it can be shown how the clothes fit the individualized body. A 360° view and close-up is also provided to view the cloth in detail. The next demo is a project Elaspix is currently working on. The customer sells the surface of public vehicles to be used as advertisement displays. By uploading images (ad themes), adding texts and choosing colored backgrounds designers can better understand which parts of which vehicles can be used as displays and what’s more which cannot be used because of security or operational issues. As part of this project the busses and trains can also be placed in a natural environment to inspect the effect of real natural lighting, reflections and shadows on the displays. 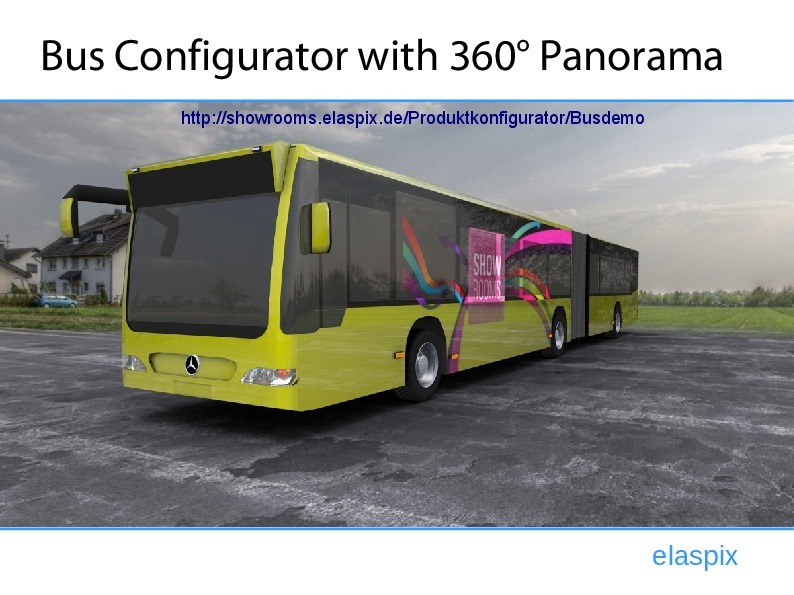 Here a 360° panorama is used to enable viewing the bus from all angles. 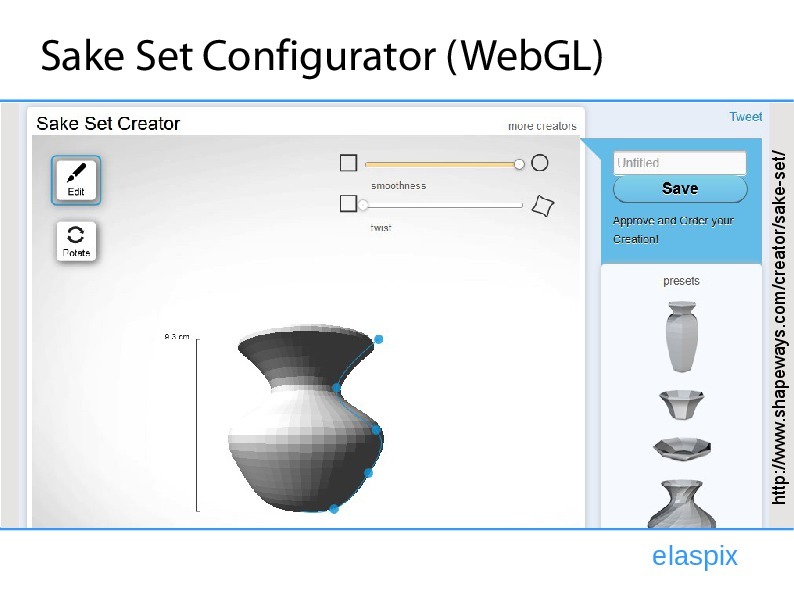 The next demo (Sake Vase configurator) is made by Shapeways which is a 3D-Printing company and shows a Vase configurator with almost no render latency as this app is using WebGL instead of our render farm. However the penetration of WebGL is still below 70% among all devices such that we cannot build on it at it is not working on each and any device, yet. Furthermore, the complexity of the bus application above, for example, is so high that a renderfarm must be used, anyway. Without the central render farm, a mobile phone user would have to load 200 Megabytes of model and texture data.